Tuna Crabs Invade Dog Beach — Sun Power RV - Go Power solar panels, inverter kits, battery sales and installation for RV, motorhome, and yacht. I went surfing on this June gloom morning and discovered small red crabs called Tuna Crabs are washing ashore all over Ocean Beach. The little buggers swim like squid and could be seen through out the water I was surfing in. I think one of them tried to pinch my foot. No pain followed so I knew it wasn't a sting ray. The water was fairly clear this morning so it was kinda cool and creepy seeing them all over. They are called Tuna Crabs because they are frequently seen around tuna in the open sea. 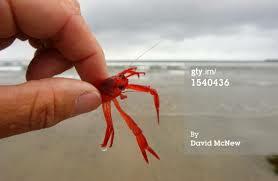 Scientists believe they get carried ashore when the water temperature warms. More proof of an El Nino year setting up? Newer PostAnother Complete Solar Elite-320 installed.